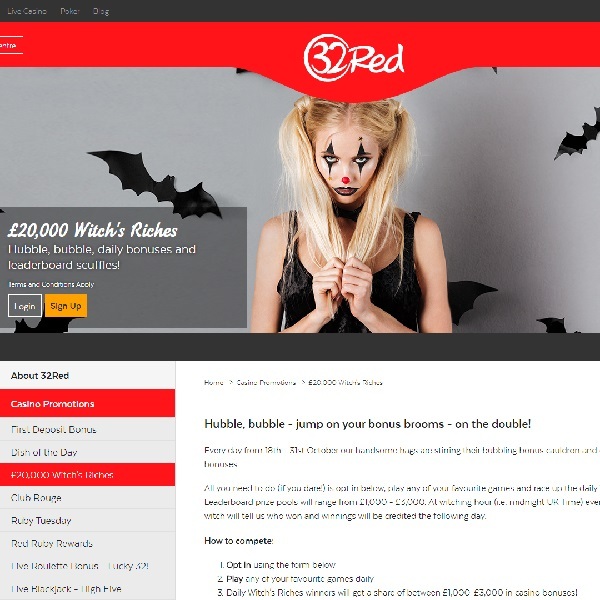 With Halloween just around the corner, 32Red Casino is running a £20,000 Witch’s Riches promotion and you could win a bonus every day until 31st October. Simply opt into the promotion and start playing your favourite games to climb up the daily Witch’s Riches leaderboards. The leaderboard prize pools range from £1,000 up to £3,000 and the race begins again every day at midnight. Every day one hundred players will win a share of casino bonuses with a total of £20,000 of bonuses to be given away by the end of the month. This is a great chance to enjoy your favourite games and with a bit of luck win a little extra (or possibly a huge bonus). Make sure that you don’t miss out, head over to 32Red Casino today, and every day until the end of the month, and climb your way to the top of the leaderboard and huge prizes.